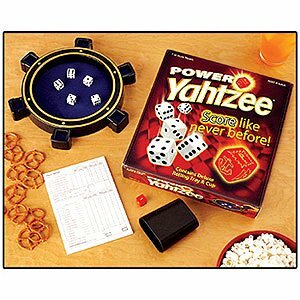 Power Yahtzee is a twist on the classic game of Yahtzee. It plays like the original game, except the scoring is supercharged. I was skeptical when I first picked up this game as to whether it would work or be just too plain crazy. As it turns out, this sequel is a lot of fun and is justified in joining the ranks of regular Yahtzee for being a household classic. Power Yahtzee has the look and feel of normal Yahtzee, except for the new “yacht wheel” you will be rolling into (a tribute to the game’s founders) and the red of the additional die might catch your eye. The game refers to it as the Power Die and its function is to double, triple, or freeze your score, or grant you a bonus fourth roll. On your turn, you shake and throw all six dice. If the Power Die is feeling generous and gives you a x 3 + bonus roll (called a Power roll), you’ll want to set that die aside to apply to your final scoring process. Similarly, if you don’t want to risk getting an anchor (which freezes your roll and does not multiply anything), you might choose to set simply a x 2 aside.You’re rolling to try to get all of the same types of plays as in regular Yahtzee (four of a kind, Small Straight, etc. ), with the addition of two Pairs (almost a Full House) and Your choice (count and add only 6s, for example) with this game. What makes it different from normal Yahtzee is that almost all rolls will have some sort of multiplier added to them; a Large Straight worth 40 points on its own would be written down as 120 if you scored the x 3 multiplier. If you manage to get three Yahtzees (five dice reading the same number), the third one is worth 150 points, plus your multiplier! Just like in the old game of Yahtzee, though, sometimes you’ll be forced to write “0” as a value for one of your slots. The game stops as soon as someone has filled up all of their score slots. This may happen even if other players’ score sheets have blanks left, because on one side of the die there is a pair of sails, which make you record your score for two values on your sheet instead of just one. This may or may not be an advantage when it comes to total scores for the players who do this. It is the player with the highest score after going through final score card calculations who wins. Power Yahtzee is just as fun – if not more – than traditional Yahtzee. It’s a good game of math, strategy, and also some luck. It’s one of those games you can keep around and play again and again. The black shaker cup the game provides to roll your dice in is extremely loud. Just use your hands and roll into the yacht wheel to nix the annoying noise. 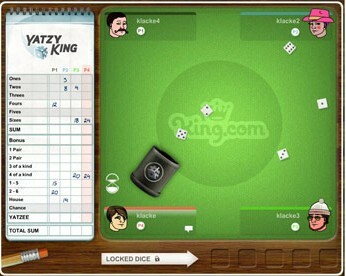 Power Yahtzee is a great choice for devotees of the original Yahtzee and dice game enthusiasts. It won’t be as joyous for those who dislike games involving chance.